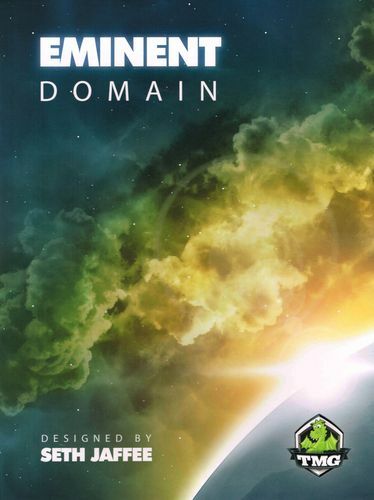 Eminent Domain is a game by Seth Jaffee, published by Tasty Minstrel Games. It is for 2-4 players. In this game, players will be building an empire in space. They will be surveying new planets to colonize or they can take them over through the use of warfare. They will also be producing and trading goods while researching new technologies. The player that gains the most influence for their empire will be declared the winner. To begin, the board is placed on the table. All the role cards are separated into stacks and placed on the board except for the Politics cards. One of these is given to each player. Players then receive a warfare and 2 of the following cards: colonize, research, survey and produce/trade. Players are randomly dealt a starting planet tile which is placed in front of them face down. The remaining start planets are returned to the box. The planet cards are shuffled and placed face down near the board. Players are randomly dealt a player aid. The player that receives the aid with the start player on the back of it becomes the first player. The influence tokens are placed near the board, setting aside the 8 tokens that are different colored. The technology cards are separated by type and sorted by cost before being placed face up in 3 different piles near the board. Players now shuffle their starting cards and draw 5 from their deck. Play now begins. On a player’s turn, they will each perform 3 phases; action phase, role phase and cleanup phase. The first phase is the action phase. This phase is optional and can be skipped if the player chooses to. In this phase, the player may play a card from their hand and resolve it’s action effect. Survey cards allow you to draw 2 cards from your deck. Warfare allows a player to either collect a fighter token or attack a planet by returning a number of fighter tokens and flipping over a planet in the player’s empire. Colonize cards allow a player to colonize by placing a the card under a planet in their empire or to settle a planet that has the correct amount of colonies already on the planet. The produce/trade card allows a layer to either add a resource token to an empty slot on a planet or to return a resource for 1 influence token. Research allows a player to remove 2 cards from their hand from the game. This helps to thin down the player’s deck. Politics allows a player to trade it for a different role card. 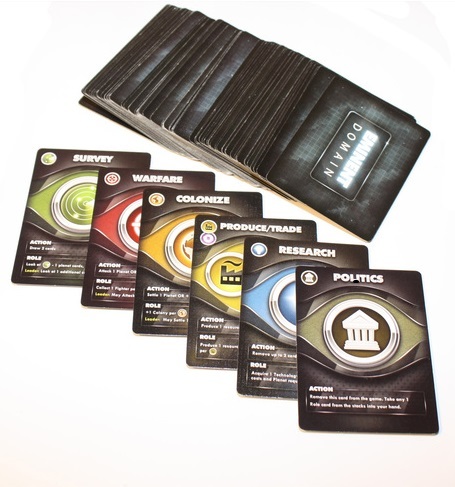 The politics card is then removed from the game. Some technologies also have actions which do different things, depending on the card. The next phase is the role phase. In this phase, the player leads one of their role cards by choosing a card from the board and playing it in front of them. The card may then be boosted by adding additional cards from their hand with matching symbols. The role effect is then resolved along with the leader bonus, taking into account the number of symbols used to boost the role. The survey role allows a player to look at 1 fewer than the number of survey icons played and add it to their hand. Leading allows them to look at 1 additional card. The warfare role allows a player to collect fighters for each symbol used. Leading allows the player to attack a planet instead of collecting fighters. The colonize role allows a player to place 1 colony per icon under a planet in their empire. Leading allows them to settle a planet with sufficient colonies under it instead. The produce role allows a resource to be produced on empty slots for each icon while the trade role allows a resource to be traded for 1 influence for each icon. Leading in either produce or trade allows no bonuses until the stack is depleted, then it adds 1 icon of the appropriate role. The research role allows a player to take a technology card and add it to their empire, assuming they have the prerequisite planet(s) and enough research icons to pay for it. Leading in research provides no bonus until the stack is depleted. Like the produce/trade role it then gives an additional icon at that point. When the player finishes with leading their role, the remaining players in turn order may either dissent or follow. Dissenting allows them to draw an additional card from their deck. Following allows them to play cards from their hand that match the symbol of the chosen role and perform the role effect without the leader bonus. The final phase is the cleanup phase. In this phase, the players discard any played cards and the active player may then discard any additional cards that they would like to. They may then draw cards till their hand limit is reached. Play then passes to the next player. This all continues until either the influence supply or a number of role card stacks are depleted, depending on the number of players. In a 2 or 3 player game it only takes 1 stack, while 3 and 4 player games require 2 stacks depleted. Scoring then takes place. Players add up their influence from any influence tokens gained and from face up planets in their empire as well as any technology cards with influence on them. The player with the most points is the winner. This game has some really great components. The board has clearly defined places for each stack of role cards much like Ascension’s board does with it’s cards. The different role cards have bright colors and icons on them. I almost wish that they would have had some different artwork along with the role icons but it makes sense with the game so I’m not complaining. The planet cards are really cool looking. They have that great space feel like something from Star Trek. The starting planet cards are less like cards and more like thick tiles which makes them easy to pick out from the others. The technology cards have some truly breathtaking artwork on them that I seriously love. The resource tokens are all brightly colored for each of the different resources and are thick wood. The influence tokens are thick cardboard and they look nice as well. The player aids are thick cardboard like the start planet tiles. I especially like that the start player is easily determined through handing out these tiles. It’s a very ingenious idea. Of course the coolest part are the plastic fighter tokens. They come in 3 sizes and each one is fantastically detailed. I love just looking at them. As I said, each piece is great and of very high quality. This is one amazing looking game. The rulebook for this game is very pretty to look at. Each page is printed in glossy color. There are tons of great pictures including how to set up the game. Everything is easy to read and understand without any problems. Each of the roles and actions are defined in great detail. There is even a glossary of certain terms that are used in this game. Also included are some game play variants which are for extended 3 player games and the learning game for new players. I think that the best part though has to be the last page which shows a quick reference guide for all the technologies available in the game. It really shows off the beauty of these cards. I really love the look and feel of the book and find it to be as high quality as the components. This game is a load of fun. It’s pretty well known that I love a good deck building game and this one does not disappoint. It’s absolutely fantastic. I really love how the theme really works in the game and makes it feel like you are building your own space empire either through colonization or warfare. I really feel like a cross between a Starfleet Captain and the Empire as I either colonize or attack planets, adding them to my cause. The technology cards really help to amp up your engine that you build through role selection. Much like other deck builders, this game changes with your chosen cards through your particular play style. The game is not that difficult and can be learned fairly easily. Of course some of the terms might be a little confusing the first time so it’s recommended to play the learning game. We decided not to do that and jumped straight in to the full game. I’m glad that we did as we really had no troubles at all. My son loved the theme as did I and we both love the game play. I mostly concentrated on warfare whereas he relied more on colonization. After seeing me conquering planets left and right he began to turn his attention more to warfare as well. Needless to say, this was the first stack to be extinguished. The only complaint about gameplay that I could come up with was that every one of the players started with the exact same deck to begin with. Of course this is fixed with the Escalation expansion that will be reviewed at a later time, so I won’t really go into that here. In any case, the game is truly amazing and we all love it. Eminent Domain is a light to medium weight deck building game full of strategy. It can be played in about 45 minutes but will probably take over an hour for the first play through. It did for us anyway. The setup is quick and choosing first player is really simple through the use of the player aid tiles. I love the artwork and find the theme is really integrated quite well. It feels like you are creating your own space empire. Everything from the cards to the plastic fighter tokens looks amazing, although I kind of wish that there had been more of that great artwork on the role cards instead of the large icons. It’s not that difficult and is fairly easy to learn. Fans of deck building games like Ascension or card games like the Star Wars LCG should thoroughly enjoy this game. I absolutely love it and find myself wanting to play it every opportunity that I can. I highly recommend it. It brings out my inner Starfleet Captain. “Space, the final frontier…”. This entry was posted in Reviews and tagged board, board games, card, card games, domain, eminent, eminent domain, games, jaffee, minstrel, seth, seth jaffee, tasty, tasty minstrel, tasty minstrel games. Bookmark the permalink.